No! No! I can fix it! I can! Me! Me! I heard this afternoon McCain is suspending his campaign until Congress votes on a bailout of Freddie Mac and Fannie Mae…he’s finally got some momentum, actually is pulling ahead in the polls and there’s a lot of buzz…now to piss it all away. Dude, get over yourself. You aren’t going to solve it single-handed, and it’s highly unlikely it’s going to get solved, anyway. Just go back to campaigning and get the debate theme changed to domestic economy issues. Or go play around in the Senate and let Sarah do the campaigning. She does a better job of it anyway, and more people will want to hear her. On second thought, you go take care of that little problem in Congress. Sarahcudda will take care of the campaign just fine, dontchaknow. 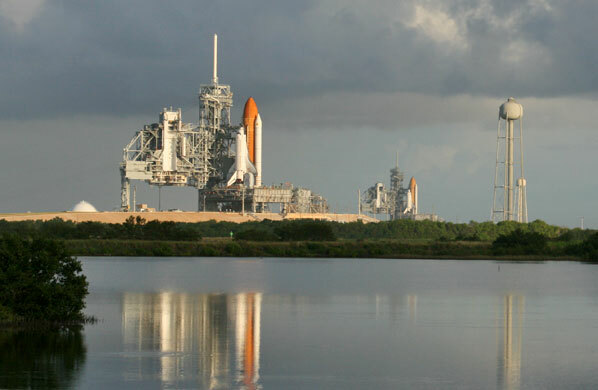 Something you may never see again, either…even if two shuttles were on the pads at the same time, which is very unlikely, at least one should be enclosed by the service tower. This only happened for a few hours last Saturday morning. It’s probably the only time a shuttle will ever be used as backup to another. Since the Hubble repair mission doesn’t stop at the ISS, in case of problems there would be no place for the crew to stay until a mission could be launched. You are currently browsing the The Old Gray Cat blog archives for the day Wednesday, September 24th, 2008.